Two miles from the Sugar River, a small creamery is making a big splash with cow's milk yogurt. For the past 11 years, the dairy has been successfully producing local, non-homogenized, preservative free traditional yogurt at their facility near Albany in southeastern Wisconsin. Ron and Chris Paris named their Sugar River Dairy after the gentle river that loops through area farms and is loved by canoeing and inner-tubing enthusiasts - a tributary of the Rock River - because they figured most of their yogurt sales would be local. Their belief that simplicity creates better yogurt has led them to employ minimal processing techniques to produce three varieties of yogurt -- 6 ounce cups in four flavors, including raspberry, peach, strawberry, and blueberry; 24 ounce cups of low-fat vanilla, low-fat plain, and whole milk plain yogurt; and 24 ounce containers of plain Greek style yogurt. The dairy operates hyper-locally, with much of the milk for their yogurt coming from just a little more than a mile down the road. Some of the whole milk used by Sugar River Dairy comes from Ron’s brother and sister-in-law’s cooperative--Bert and Trish Paris--who live south of Belleville. Members of the cooperative manage their cows using grass fed grazing strategies for about 5 to 6 months of the year. Sugar River's Greek-style yogurt uses a higher percentage of protein, adding three additional grams of protein per serving. 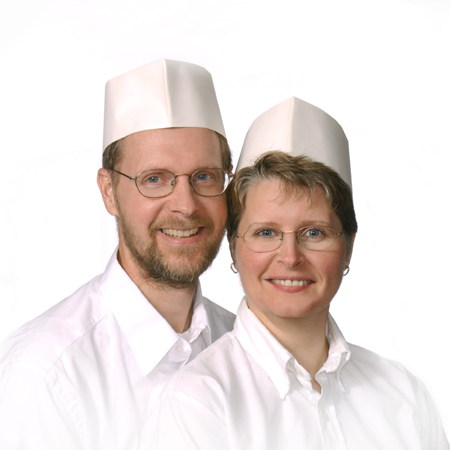 The couple generally makes 6000 to 7000 pounds of yogurt during their four production days each week. The dairy also produces frozen yogurt, which has limited distribution.